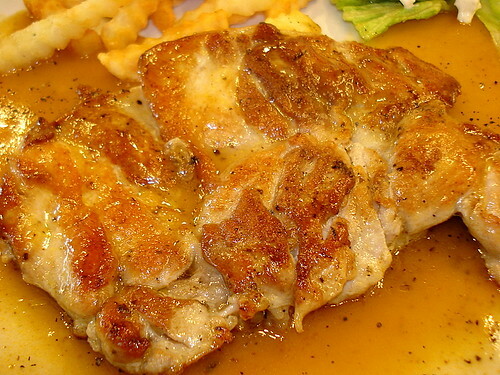 Grilled Chicken Chop from Pat's Western Delights, originally uploaded by Camemberu. Man, I haven't had grilled chicken chop in the longest time. Today I indulged. I like it really crisp on the outside - this one was done quite well on the underside (pictured) but not so on the skin side. Don't really care much for the brown sauce it usually comes with. Prefer to add chili sauce! Comes with fries and coleslaw, originally uploaded by Camemberu. Well this is obviously not haute cuisine, but moderately satisfying. At S$6 with two competent sides, it's cheap and cheerful. Pat's Western Delight, the western stall at the Banquet food court (Level 3) in Parkway Parade, always serves up stuff on huge plates (more than a foot in diameter). I remember they used to be quite decent, before the renovation (can't say the same about the other stalls). This is the first time I've gone back to them since. Would not mind trying the other stuff they have some other day. This looks very tempting and I'm definitely having chicken chop tonight.